Disclaimer: it has been several years since I first started reading this series, so I am at the mercy of time and my deteriorating memory. Official warning: reader discretion is advised before beginning this series. It is graphic and sometimes disturbing. Personally, I’m okay with it. It’s done to make a point, and it works. Other people might not be able to move past that. Official business complete! On with the reviewing. 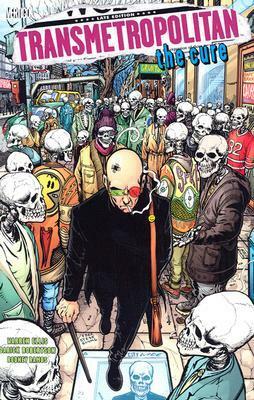 Transmetropolitan is a delightfully bizarre, often deeply disturbing series. The series main character, Spider Jerusalem is a journalist. He has “filthy assistants”. Together, they have adventures and report the news. At the beginning of the series, I enjoyed it but didn’t really see where it was going. A few volumes in, Spider begins to uncover a story that is bigger than he had originally anticipated. This plot line slowly increases in importance, becoming the central arc of the series. Another interesting development as the series progressed was that I started to really care about the characters. Initially, I just sort of saw them as some sort of deeply disturbed part of Warren Ellis’s brain that had come loose. By the last volume, I was so invested that some sort of water came out of my eyes a little while I was reading. It was strange. All in all, I strongly recommend this series for lovers of: Warren Ellis, strange cyberpunk dystopian comics, or weirdly profound commentary on new media/technology and its effects on journalism, politics, and society as a whole. This entry was posted in Reading and Books and tagged books, graphic novels, reading, TBR-challenge on March 21, 2013 by michelejames.